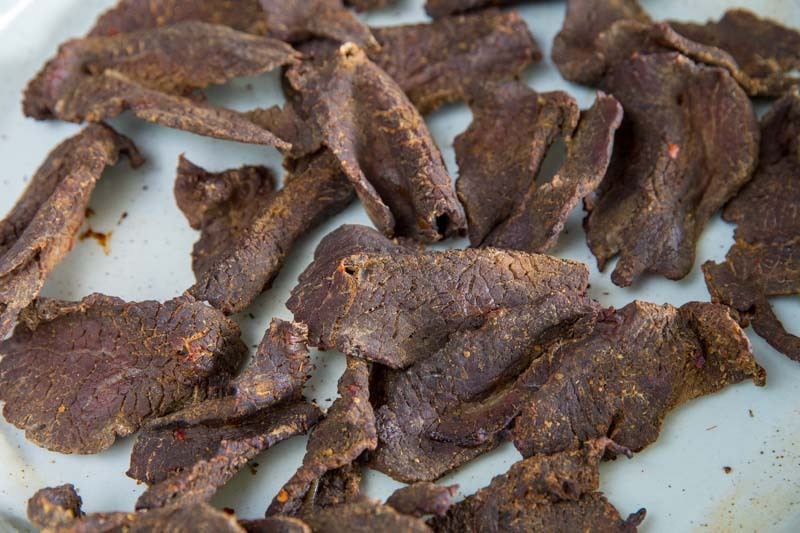 Great beef jerky seasoned with flavors such as garlic, hickory, and onion can be made at home. YES YOU CAN MAKE THIS AT HOME. Using your Kamado style grill and a bottle of Jerky Gold Marinade you too will be the envy of friends and neighbors with this delicious homemade treat. Now sit back, grab an ice cold PBR, and enjoy this post for Homemade Beef Jerky Kamado Grill Style. My good friend Parx (aka The GoldFather) has been making jerky since the tender age of 11 when he learned the craft from his father. Jerky Gold marinade is the culmination of years of experience distilled in two bottles: The Original and The Italian. For this post I used Eye of Round steak as it is very lean with hardly any fat to trim. This cut works well with jerky as the goal is to express as much of the moisture from the beef as you can leaving a tasty dried piece of beef for you to snack on. Before slicing the Eye of Round beef into thin strips I placed the beef in the freezer for 30 minutes. This gives the meat enough firmness helping me to slice it very thin. I divided the beef slices into two batches one for the Original marinade and one for the Italian marinade. After the slices of beef sat in the marinade overnight (12 hours to be exact) it was time to set up my Big Green Egg. As the temp for this cook needs to stay below 200° I used a very small pile of lump charcoal and lit it with a firestarter. In addition, I used a Large 3 Leg Spider and a Raised Grid in order to place a ceramic stone between the charcoal and the raised cooking surface giving me enough space to hang the beef. To control the temperature inside the Large Big Green Egg I used the Flame Boss 200 set to 175°. This device kept the Big Green Egg at that temp for the entire cook. Once I got the Big Green Egg up to 175° I removed the beef slices from the marinade and skewered them onto metal skewers. The tricky part of this was to stay patient as I slid each slice of beef between the rungs of the cooking grid. Once I did this for each skewer my marinated beef slices were ready to cook and turn into amazing homemade Beef Jerky! Making Beef Jerky uses most of your five senses most importantly taste, sight, and touch. The goal is to cook the beef long enough to dry out but not too long to overcook. I started checking the beef at the 3-hour mark and again every hour after that until done. This cook took me 6 hours to get delicious homemade Beef Jerky. There are several ways to use your senses to see when the cook is done first is the finger squeeze test. At the 3-hour mark take a piece of the jerky and squeeze it between your fingers. If it is squishy and you can still feel the moisture, it is not done. Next is the sight test. At the 3-hour mark tear a piece of jerky off and rip it in half. If the meat is still pink or bright red inside it needs more time. Another way to use your site to test doneness is to hold a piece up to a bright light and see if it is transparent. If the meat is almost see-through then your are done as most of the moisture has been cooked out. Finally, at the 3-4 hour mark, take a piece off and taste it. Do not worry this won’t kill you as “The GoldFather” has used this method since age 11 and he is still going strong. For me, the homemade Beef Jerky was perfect right at the 6-hour mark. I pulled the skewers off and rested them in a bowl to cool down. Once the homemade Beef Jerky was cooled (10 minutes or less) I tasted the finished product. Both flavors are delicious and worth a try. If you like things on the spicy side than the Italian version is the one for you. This was my first time making Beef Jerky but it certainly will not be my last! Making delicious beef jerky at home is easy to do and tastes better than any store-bought jerky will ever have. Remove all fat from meat. Place meat in the freezer for 30 minutes. Slice strips no thicker than ¼ inch for best results. Marinate meat refrigerated in a large bowl or gallon Ziploc bag for 12-24 hours (12 is plenty), stirring occasionally. (DO NOT REUSE MARINADE). Set up your Kamado grill for indirect cooking using a raised cooking surface. Preheat the grill to 175°. Hang meat vertically between rungs of the cooking surface draping the meat down below. Slowly roast the marinated beef strips on the grill at 175 degrees until dry (6-12 hours depending on thickness). To maintain the temperature of 175 use a device like the Flame Boss 200. You will know when the jerky is done by touching it to see if it is "squishy" and thus holding onto moisture, or ripping a piece in half to see if it is still pink inside. Once done remove from the grill, allow to cool, and store in a dry space.